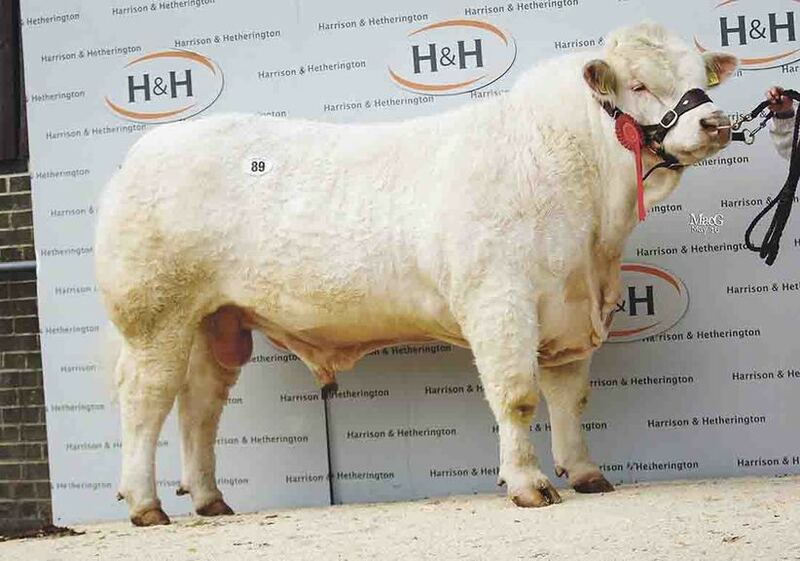 Charolais met a strong commercial demand with 67 bulls selling to 14,000gns and averaging £5,007 at the Carlisle Spring Charolais sale at Borderway mart. Leading the trade was 17-month-old Goldies Joss from Hamish Goldie, Ruthwell, Dumfriesshire. By Gretnahouse Heman out of Goldies Dignity, it sold to William and James Causey, Co Tyrone. Three bulls sold for 9,000gns. The first, Nuthamsptead Judas, a 16-month-old class winner by Thrunton Goldeneye and was jointly purchased by John Christie, Stirling and Iain Millar, Port of Menteith, Stirlingshire. 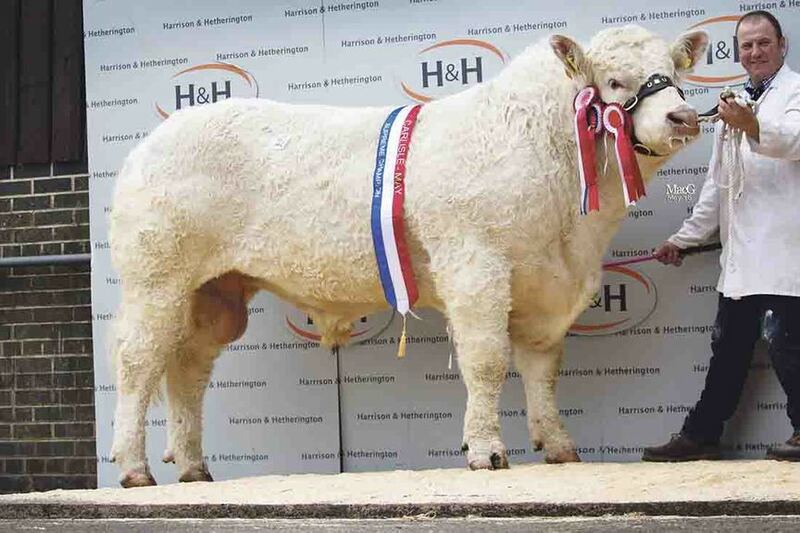 Judas was consigned by Caylers Charolais, Nuthampstead, Hertfordshire who also sold Caylers Legend, another son of Goldeneye, at the same money to J. Nelson, Castle Douglas. The third bull to sell for 9,000gns was the red ticket winner, Newhouse Longbow, by Elgin Glenlivet, from R.M. Adam and Son, Forfar, which was knocked down to Messrs Evans and Corfield, Ludlow, Shropshire. 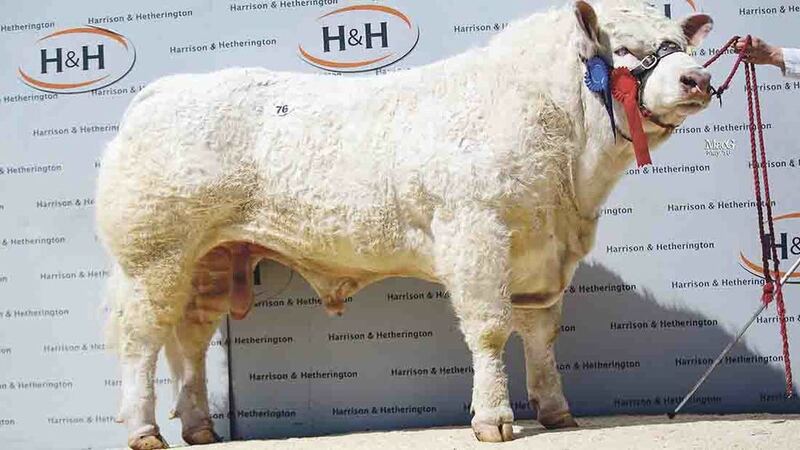 A string of bulls from Alasdair Houston, Gretna Green, saw five bulls average £7,088, with a high of 8,200gns for Gretnahouse Jungle, by Balthayock Adonis, which went to A. and T. Wilson, Newton Stewart. Mr Houston’s supreme champion Gretnahouse Jugular, a 20-month-old son of Blelack Digger, sold to the judge, Gareth Roberts, Llangadfan, Powys, for 8,000gns. The reserve male and junior champion, 16-month-old Cleaden Juggernaut by Cleaden Guardsman from Michael and William Cleasby, Penrith, made 8,000gns selling to John Weir, Galashields. The female champion and reserve supreme champion from Hamish Goldie, was the 20-month-old Blelack Digger daughter, Goldies Julianna, which sold for 4,000gns to Thomas Epps, Isle of Islay. 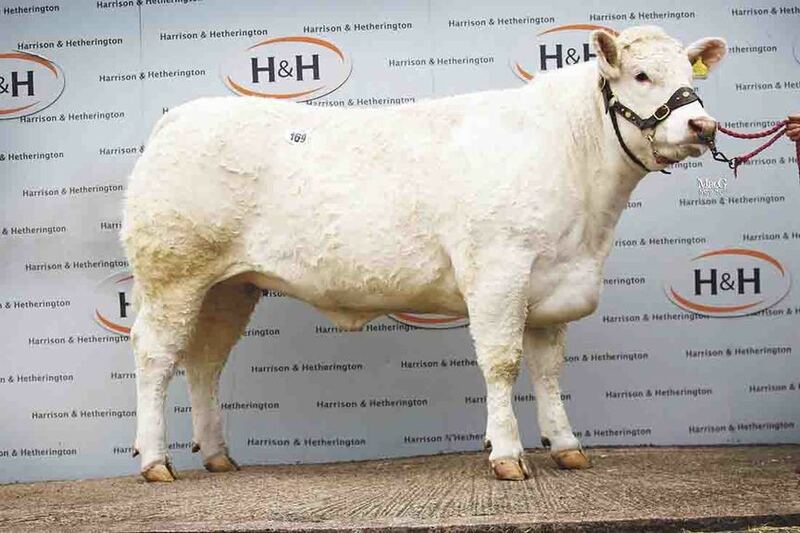 The draft sale from Messrs Curry’s Burradon herd from Morpeth, Northumberland peaked at 3,800gns for Burradon Emily, by Gwenog Banjo, and her five-month-old heifer calf Burradon Leanne. The buyer was A. McCornick and Co, Dumfriesshire. Next at 3,100gns selling to E. Townend, Huddersfield, was Burradon Fallon and her six-month-old daughter Burradon Loticia.